Businesses today rely on point of sale terminals to process the electronic transactions that are becoming increasingly commonplace in today’s retail world. The cash-only business still exists, but it’s becoming a fixture of the past as more transactions move to the digital realm. Another component hastening the demise of cash only is the Internet. Online commerce has increased steadily over the years, which has put retailers in the position of requiring upgrades sooner rather than later. The first electronic cash registers were very different than the hardware used today. 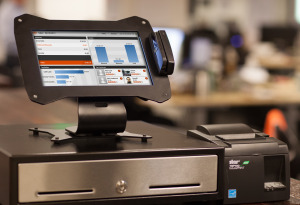 POS systems had to be built for extremely specific uses, so the software was very limited in its functionality. IBM was one of the first in this space, releasing cash registers in 1973. Original designs relied on a mainframe computer that could control up to 128 separate terminals in the building. McDonalds stores were actually one of the first organizations to adopt microprocessor-based cash registers. At that time, it was a huge leap for McDonalds to be able to display a customer’s order on a screen. Today’s drive through windows use LCD screens, to put things in perspective. In just 30 years, we’ve come extremely far in terms of how customers are able to place orders. What made these changes so important? Prior to the McDonalds revolution, it wasn’t easy for customers to verify an order. Servers could also give the order to cooks in the back to begin working on an item as the customer placed another order. This dramatically improved both efficiency and accuracy, which is a major component to why McDonalds has been able to dominate. Technology plays a key role, so merchants who try to stay ahead of the curve in payment processing tend to see the greatest benefits for their investments. Bio: Firoz Patel is the Executive Vice President of the Payza platform. Since 2005, Firoz Patel has built a reputation for being a globally recognized leader in payment processing.